Imagine that … you are participating in a quiz show and you have an internet access which no other participants have. How would you rate your chance of winning the quiz competition? Imagine that … you have been transported back in time – not by too much – just by about 100 years to the year 1912. How would you rate your chance to earn a living? Imagine that … your company has got a mandate to do everything internally – that is not to depend on any outside source for ANY material or service. What all do you have to do to be completely self-sufficient? Imagine that … you are working on an innovative product or service but you have one restriction – you have to get it right in the first attempt and you cannot do any trial. How would you rate your chance of success without any user feedback? So, what is more important than knowledge? When you want to consult a Doctor who specializes in a particular field of medicine, how would you choose? Why has Interbrand, (a company which specializes in creating and managing brand value), rated Coca Cola as the most valuable brand for the last 11 years? Why did Adidas pay David Beckham, the soccer player around $160 million and Nike pay Tiger Woods $100 million for their product endorsement? Why is Facebook which has a revenue of around $4 billion has a valuation of anywhere between $50 billion to $100 billion? How did Apple, selling iPhone and iPad, manage to become the most profitable company in the world while their competitors with similar products (selling in huge number and at about the same price point) struggle to remain in black? Why is it more important for an academician to count the number of citation the publication receives rather than the total number of publications? It is all about how we are connected to each other, individuals are connected to organizations and how organizations are interconnected. This is the basic of all collaboration – how individual bits of knowledge get connected to form a whole which is much larger than its parts. How much of your time do you spend cultivating the item on the left compared to the item on the right? How much of our formal education is devoted to item on the left compared to the item on the right? This topic has been on my mind for quiet sometime but three things happen almost simultaneously which prompted me to write this post … finally. The announcement that MIT, Stanford and others are offering many of their courses online and free. Frederic Moraillon invited me to join the LinkedIn group on Hyper-connectivity. So, it is again a network effect! WordPress provides a nice graphical representation of the hits. 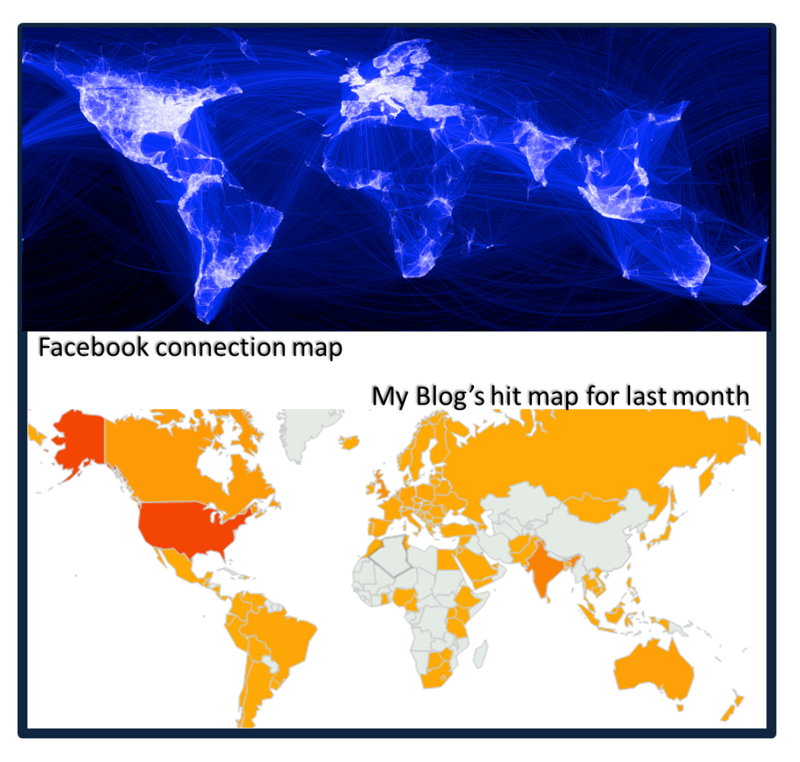 I have put an image alongside the Facebook connection map. The similarity is interesting! Here is an interesting viewpoint on how this hyper-connectivity is affecting us. This is a great article, you have hit the on the head what so many people don’t get right. That is, brand is how a company is ‘perceived’ not the logo, trademark etc. I absolutely agree that the knowledge and insights available from one’s network far outweighs what is available to the individual alone. I would suggest that greater still is the ability to filter, analyse and synthesize this knowledge and insight.